"There was an army bred for a single purpose, to destroy the world of man." Prior to the initial release of The Lord of the Rings: The Fellowship of the Ring in December 2001, writer/director Peter Jackson could not have expected such a monumental response from critics and audiences. The studio nervously hoped to make a profit, and Tolkien fanatics wondered if the ambitious trilogy would meet their high expectations. Following a lengthy and very successful theatrical showing, the film warranted two very different DVD releases. The original version appeared in August and included promotional featurettes and trailers. It delivers for the casual fan, but pales in comparison to the gigantic four-disc set released in November. Featuring considerable extra footage and a wealth of stunning documentaries, this collection raised the DVD standard. 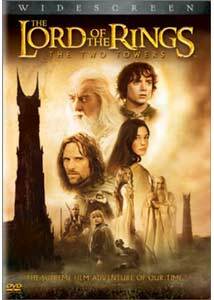 The Lord of the Rings: The Two Towers follows an identical format and also will be presented in two releases. This two-disc set gives us the memorable theatrical version, but it is merely a precursor for yet another huge November offering. The tale moves seamlessly between each element and pushes everything towards the final chapter. Being the second part of a trilogy, this film is very plot-heavy and lacks a bit of the wonder generated by the first entry. However, a similar drawback exists in the source novel, which must bridge the other parts and include considerable action. This movie actually removes several pivotal moments from the book and shifts them to the final chapter. Jackson and his co-writers took considerable heat from Tolkien fans for these alterations, but it should make the eventual The Return of the King a classic. Another major change occurs with Faramir (David Wenham)�Boromir's brother�who captures Frodo and Sam. They venture to a Gondor stronghold and encounter the Black Riders, which does not occur in the novel. Luckily, this sequence does serve an impressive purpose. It enhances the personal struggle and again demonstrates the ring's power to attract even well-meaning individuals. Extras Review: This two-disc edition of The Lord of the Rings: The Two Towers includes mostly promotional featurettes that offer limited information. Some worthwhile items do appear, but they offer just a quick glimpse at the production. On the Set of Lord of the Rings: The Two Towers is a 14-minute special that originally appeared on the Starz network. It provides far too much plot summary and only glosses over the more interesting details. The actors speak pretty generally, and many shots appear from the preview trailers. Return to Middle-earth is a much longer WB television special with more extensive coverage. The material here remains on the promotional side, but there are some entertaining tidbits about the actors. They formed a very close bond during the two years in New Zealand, and it is present everywhere during this special. Initially running as an hour-long special on television, this entertaining show stays light, but it does provide an enjoyable time waster. An odd but enjoyable bonus is the short film The Long and the Short of It�written and directed by Sean Astin. Shot on a weekend break during reshoots of the The Two Towers, this six-minute gem is short and sweet. It stars director of photography Andrew Lesnie and contains no lines of dialogue. Peter Jackson also makes a silly cameo as a bus driver. You also can watch The Making of the Long and Short of It, which shows some big names doing menial jobs on the crew. Andy Serkis is especially funny discussing his rise and fall while filming the picture. Tolkien fanatics will probably purchase this release just to catch a preview of The Return of the King. Running for 12 minutes, this worthwhile piece includes a quick plot overview, behind-the-scenes information, and quick scenes from the film. The final battle promises to be a stunning event that dwarfs even the Helm's Deep sequence. Also enjoyable is the preview of the extended edition of The Two Towers, which lasts five minutes and gives us some excellent cut footage. The remaining supplements include two theatrical trailers, 16 TV spots, the music video of Gollum's Song, and a video game preview. The music video tune is sung by Emiliana Torrini, who sounds a bit like Bjork and projects the necessary melancholy with her voice. The game shots are very impressive and made me think about purchasing them. Finally, exclusive online DVD-ROM content is also available for computer users. Smart buyers should probably wait and purchase the extended edition of The Lord of the Rings: The Two Towers in November. This two-disc release does contain some nice extras, but they pale dramatically in comparison to the gargantuan upcoming set. This version is recommended solely for completists and casual viewers who lack interest in bonus footage and countless supplements.